At the onset of the war many German nationals were detained in Internment Camps and as the war went on the allies had to deal with large numbers of German prisoners of war. Some of these were housed in France but many were brought to Great Britain where they were held in secure POW Camps, The injured in hospitals, the more trusted in lighter secure work camps and in some cases unguarded to work on farms. Initially internees and POW's were held in the same camps but as the war progressed the different needs of the two types of captive led to the development of separate camps. Conditions were described by the Red Cross as reasonable with the provision of sufficient if somewhat boring food with the main problem experienced by POW was that of boredom. 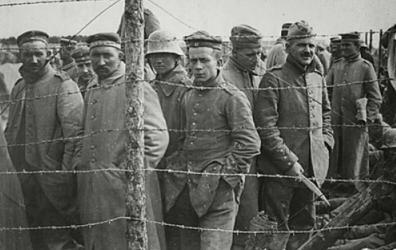 By mid 1919 most German POW had been repatriated and all had returned home by 1920, so the Camps returned to local use.